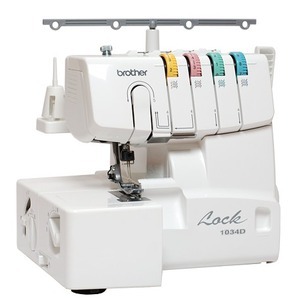 Brother R1634D is the same serger. Easily create precise, professional-quality seam finishing and rolled hems with the 3- or 4-thread cut and sew serger stitches. Choose from 4 thread overlock, 3 thread overlock, narrow hem, rolled hem, and ribbon lock stitches. The differential fabric feed helps improve the stitch quality on virtually all types of fabric, especially important when sewing stretchy, knitted, or thin fabrics. Differential feed ratio is 0.7 to 2.0. The 1034D has easy to follow, color-coded lay-in threading, and the lower looper threading system is designed to make sure the thread stays right in place. Saves time, and delivers high quality stitching, even at up to a high 1300 spm speed. The stitch width can be easily adjusted between 3.00mm to 7.00mm, helping to provide the perfect stitch width for your project. The pressure of the presser foot is fully adjustable, to help ensure consistently highly quality stitching on both heavy and light fabrics. Loosening the pressure for lightweight materials will help prevent puckering, and will allow for easier sewing of curves. The pre-tension device allows for smoother delivery of thread, and the tension for each needle can also be individually adjusted, for even more precise control for each type of thread. Simply slide off the removable arm to serge cylindrical items such as sleeves. The retractable knife blade helps prevent against accidentally cutting your fabric when you're working close to the edges of rolled hems. For your safety, the 1034D will operate only when the front cover is closed. No need to purchase special needles – the 1034D can use most standard home sewing machine needles. Store your accessory tools on the front panel flip-down door. The 1034D comes complete with an instructional video, and a printed, English and Spanish operation manual. I couldn't believe how quickly my new machine arrived -it is terrific - I'm searching out more projects just so I can use it! My granddaughter bought the same machine from you - that's where I learned to use it- she recommended your site as that is where she bought hers - great service - thanks so much! This is my 2nd machine purchased from AllBrands.com and I am extremely satisfied with both.